I HAVE often been asked about the decorum one should observe when having an audience with the sultan or any Johor royalty. It is during royal occasions that the most formal standard of behaviour is required. It is my duty as Dato' Penghulu Istiadat to provide information and guide the person every step of the way, not only to avoid any wrongdoing but also to put them at ease. Invitations from the sultan are royal commands and should be answered promptly. If it is necessary to decline the invitation, a reason should be given. During an investiture ceremony, rehearsals are held the day before. I will brief the recipients on the various protocol and etiquette to be followed, including correct attire, posture and personal grooming. One of the first things I tell them when they are presented to the sultan is that they should not raise their hands to their forehead (angkat sembah). People from outside Johor may not be aware that Johor subjects do not do this when meeting royalty. Our gesture of homage is unique and distinguishes us from the other states. Some of our court customs and practices are unwritten laws and, occasionally, there have been confusions between traditions of old and new practices. We have to look at our history to draw conclusions. The writer being presented to Sultan Iskandar. Looking on is Sultanah Zanariah. As early as the 14th century, the kingdom of Johor came under various cultural influences that were assimilated into Malay customs and traditions. The Temenggong of Johor did not discard the customs and rites but made improvements in line with Islamic and western influences. Temenggong Ibrahim, who was self-taught in English, mixed freely with officers of the East India Company to acquire knowledge on administration and commerce, and in the process absorbed the English culture. He sent his son Abu Bakar to an English school. Abu Bakar's six visits to England and Europe beginning in 1866 enabled him to observe western culture and behaviour, especially in the court of Queen Victoria. The contemporary western influences he brought back are manifested in architecture, administration, education, the art of dressing and palace protocol. Since the time of the Temenggong, men and women bow their heads when meeting royalty, a gesture practised by the court of St James. One stands erect, feet close together, both hands with clenched fists by the side, leans forward slightly and bows from the neck, not the waist. Bowing low from the waist may be construed as ruku (subservience to Allah in prayer) and is prohibited. In 1982, Sultan Iskandar made a change where ladies curtsey, a more feminine movement compared to bowing. The proper way to execute a curtsey is to lower your body by pulling your left foot back and placing the palms of both hands on your right thigh. The uninitiated may feel awkward and unstable. We advise ladies to put on court shoes for comfort. Men should bow and women curtsey on being presented to or when taking leave of the royalty while Muslims say Assalamualaikum Tuanku. The royal hand is always extended with palm facing down which is an indication of acceptance. It is good manners to take the hand lightly and briefly while bowing. 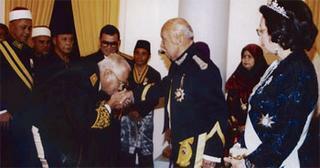 It is customary for Malays to kiss the hand of royalty as a form of allegiance and respect. Johor protocol dictates non-Johoreans must follow this gesture when attending Johor royal functions. They are informed of this requirement by palace officials. When a Johor official attends royal functions in other states, he will perform the Johor style of acknowledgement, and does not angkat sembah. At a function if you are standing in line, do bow (ladies to curtsey) when royalty passes you, but you do not shake his hand unless he stops by to converse with you. Stand straight with hands clasped in front when royalty talks to you. In the old days, this was an indication that you are unarmed. When invited to sit down, make sure the royalty is seated first. When seated do not slouch or cross your legs, which is considered the most extreme form of rudeness to Malay royalty. Let royalty initiate the conversation. You must not be articulate or speak out of turn. The sultan and sultanah are addressed as "Your Majesty" for the first time and as "Tuanku" on subsequent occasions. For the Tunku Mahkota and consort, it is "Your Royal Highness" and "Tunku", and other royal family members "Your Highness" and "Tunku". No one should leave an occasion before the royal guests. At palace functions, your departure is at the pleasure of the ruler. When an indication is given, you stand up and approach him, bow, take the proffered hand and say: "Thank you, Your Majesty" (Menjunjung kasih, Tuanku), and the greeting Assalamualaikum Tuanku for Muslims, withdraw slowly by taking three steps back before turning and leaving. At state functions, the ruler departs after the state anthem. Only then guests may leave. All royal functions begin and end with the doa. Muslims raise their hands with open palms during the recitation. Non-Muslims may leave both hands on your lap if sitting, or by your side if standing. The Lagu Bangsa Johor, a British influence signalling the arrival and departure of the ruler replaces the nobat of old.